* Annual estimated passenger usage based on sales of tickets in stated financial year(s) which end or originate at Calstock from Office of Rail and Road statistics. Methodology may vary year on year. 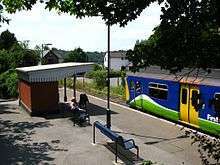 Calstock railway station is an unstaffed railway station serving the village of Calstock in Cornwall, United Kingdom. It is situated at grid reference SX 433 688 at the north end of Calstock Viaduct which carries the railway at high level over the River Tamar . The 3 ft 6 in (1,067 mm) gauge East Cornwall Mineral Railway was opened to Kelly Quay at Calstock on 8 May 1872. Wagons with goods from the mines around Gunnislake and Callington were brought down the hillside on a 0.4 miles (0.6 km) cable-worked incline with a gradient of 1 in 6 (17%). The Plymouth, Devonport and South Western Junction Railway opened the station on 2 March 1908. This line was a branch from Bere Alston to Callington Road and crossed the River Tamar on Calstock Viaduct. A steam-powered lift was attached to the downstream side of the viaduct which could raise and lower wagons to the quays 113 feet (34 m) below, making it one of the highest such lifts in the country. 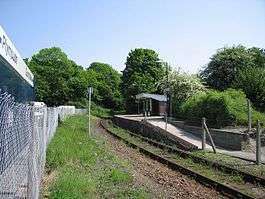 It was connected to the station goods yard by a second parallel steel stub viaduct. A short section of the narrow gauge line was retained to serve a lime kiln, but the wagon lift and all the sidings were taken out of use in September 1934. Fruit and flowers were an important part of the traffic carried on the railway and were still carried by train from Calstock until the mid-1970s. The single platform – on the right of trains arriving from Plymouth – is situated on a sharp curve which makes it difficult to see trains approaching from Gunnislake. It is on the hillside towards the edge of the village. Calstock is served by trains on the Tamar Valley Line from Gunnislake to Plymouth. Connections with main line services can be made at Plymouth, although a small number of Tamar Valley services continue to or from Exeter St Davids. Two pubs in Calstock take part in the Tamar Valley Line rail ale trail, which is designed to promote the use of the line. 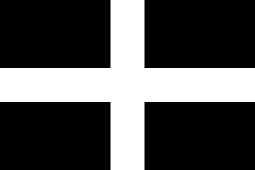 The line is also part of the Dartmoor Sunday Rover network of integrated bus and rail routes. The viaduct is 120 feet (37 m) high with twelve 60 feet (18 m) wide arches, and a further small arch in the Calstock abutment. Three of the piers stand in the River Tamar, which is tidal at this point and has a minimum clearance at high tide of 110 feet (34 m). It was built between 1904 and 1907 by John Lang of Liskeard using 11,148 concrete blocks. These were cast in a temporary yard on the Devon bank opposite the village. The engineers were Richard Church and WR Galbraith. Wikimedia Commons has media related to Calstock railway station. Wikimedia Commons has media related to Calstock Viaduct. ↑ "Name: CALSTOCK VIADUCT List entry Number: 1105516". Historic England. Retrieved 19 January 2016. Crombleholme, Roger; Gibson, Bryan; Stickey, Douglas; Whetmath, CFD (1985) . Callington Railways. Brackenll: Forge Books. Parkhouse, Neil. "Building Calstock Viaduct". Archive (2): 33–54. ISSN 1352-7991.